Getting children involved and encouraging them to retell or in early years helping you retell a story is a vital step towards them developing their own stories. Below is tip 4 of the storytelling tips we have been sharing in the the run up to National Storytelling Week (28th Jan – 4th Feb). The National Storytelling Week is in it’s 17th year and is organised by the Society of Storytellers. Check out their website for events that are taking place throughout the week in your area. But why promote storytelling in schools? Primarily because it improves literacy. If you are familiar with Pie Corbett you know how he uses storytelling to help develop story writing in his Talk 4 Writing programme. Now our own development on that is to add in creativity by getting children to make items to either help them tell the story or to help inspire their own stories. Although it may seem as if speaking and listening has less prominence in the National Curriculum than it used to it is still an intrinsic part and the basis for the rest of literacy. Good oral skills mean that children can convey their ideas and show their thinking regardless of the subject. It is also a life skill with employers constantly looking for good communicators who show creativity. Storytelling is also big in the business world as many now see it as way of marketing, by telling their business’ story. Today’s tip is one of the crucial. Can Being Dyslexic Be an Advantage? What does Richard Branson, Alan Sugar and Jamie Oliver all have in common? There are many more very successful people who have also overcome Dyslexia. So why do people say that it’s something that someone ‘suffers’ from? The way I see it the condition just means that their brains are wired differently which makes reading and writing a challenge, but more often than not they are some of the most talented people – probably because they have a knack of seeing things from a totally new perspective which makes these individuals an asset to any team! 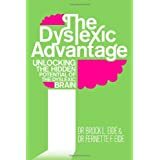 Last year I read a book called The Dyslexic Advantage by Dr Brock L Eide and Dr Fernette F Eide which was absolutely fascinating. It set out how the Dyslexic brain differs and also the different strengths that a person with Dyslexia has because no two dyslexics are the same either, but just understanding and being able to recognise those strengths in children will help any teacher/parent ensure that their children get the support they need. Often one of those strengths is being able to see the bigger picture and find creative ways of solving problems. This is certainly the case with Richard Branson he doesn’t just follow the convention he sees totally different ways of doing things.This type of dyslexic may have difficulty following a set procedure but in a world where businesses are looking for people to ‘think outside the box’ this could be an advantage. Picking up whether a child has Dyslexia at an early age is vital in order to give them the support and help that the child needs with the written word. Teaching a subject in a multi-sensory way is key to helping those children build on their natural abilities and stop them feeling isolated from their peers, children very often feel sensitive if they do not think that they are learning at the same rate as others. It will also help them to learn in a way that will allow them to excel by using their natural abilities. By teaching the whole class in a multi-sensory way those with dyslexia aren’t made to feel different and those that haven’t been diagnosed, as believe it or not under diagnosis is still an issue, can excel. In a more traditional teaching environment they may become disruptive and disengaged. Often a person with Dyslexia can be very creative and display talents in more creative and artistic areas. It is not that they can’t understand or can’t achieve in academic subjects but that they may learn better in other ways. They may be a more visual, auditory, tactile or kinaesthetic learner and when more senses are used they can engage with a lesson and provide a positive contribution because they can see things from a completely different angle. The British Dyslexia Association (www.bdadyslexia.org.uk) also has a great website for parents/teachers/employers with tools to help if you either have a child with Dyslexia or help assess whether a child in your care has Dyslexia which is the first step to helping our future generation and encourage more super talented people to succeed.